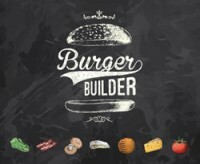 In Burger Builder each of you operates your own local burger joint, satisfying the neighborhood’s everyday craving of burger. Optimize your inventory while, at the same time, completing as many profitable burger orders as possible before the game ends! It is very important to keep a good balance of ingredient in your stock to accommodate the trickiest customers that could walk in anytime. Without careful planning, great profitable opportunities could be missed! Every ingredient has its characteristic: some are more commonly used, some give greater profit margin, and some are themed ingredient in a combo which give bonus profit. Players should consider what ingredient cards to draft according to their competitors/their own strategies. NOTE: As of September 7, 2014, the initial Kickstarter for this game had not funded successfully. X-Axis promises a relaunch at a future date.